, Tap: Target creature gets +1/+1 and gains trample until end of turn. Xenagos, God of Revels - Crazy synergy with your Boss and curves out really well. Drop Xenagos, cast your Boss in the following turns and have it grant haste and +6/+6 to your Boss, swing in for 24 Commander Damage! Downhill Charge / Blazing Shoal - Free pump spells are great, especially since the CMC for your dragons are on the high side. You'd have plenty of "fat CMC" spells in your hand to remove for Shoal as well. Surge of Strength - A hidden gem that is easily overlooked. It'll buff your Boss by +7/+0, making him hit for 26 commander damage if unblocked! Rush of Blood - Simple but effective. Berserk / Fatal Frenzy - Go BIG or go BROKE with them! 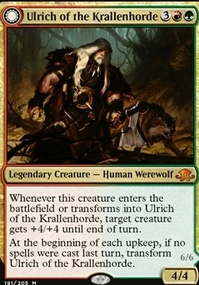 Kessig Wolf Run - To replace Skarrg, the Rage Pits as you need +X type effects rather than +1/+1. 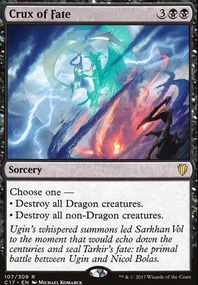 Mirrorwing Dragon is a fun and "win more" card since you usually don't have sufficient creatures to benefit from the "cascading buffs" the dragon offers. With both Nikya of the Old Ways and Nullhide Ferox in the deck you may want to trim down the number of non-creature spells in the deck. Comet Storm does everything that Volcanic Geyser does and then can do it to multiple targets. Siege Behemoth gives the Thorn Elemental ability to your whole team and offers some protection for itself as well. Guardian Project and Soul of the Harvest offer more card draw from casting critters. 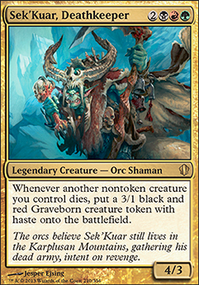 Skarrg, the Rage Pits can give a little combat boost plus grants trample. 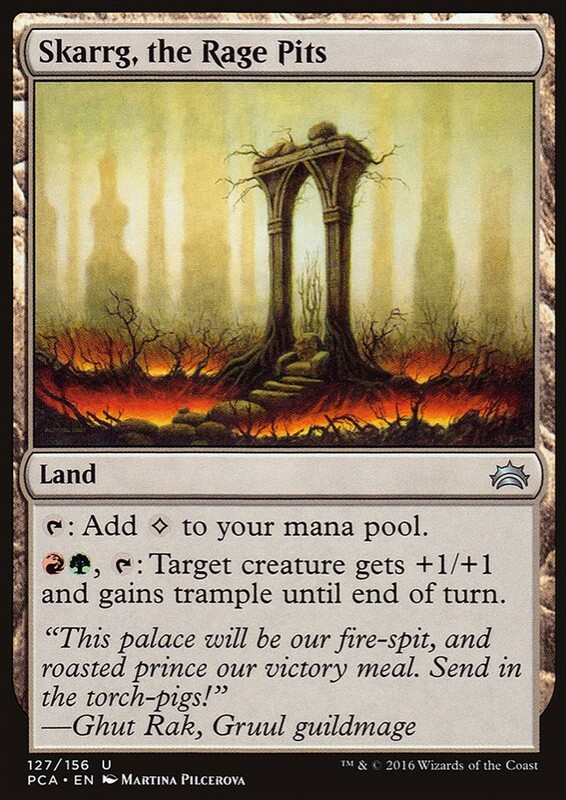 Almost any mana rock out there is an upgrade over Manalith ; Gruul Signet , Mind Stone , Commander's Sphere , etc. Plus Sol Ring means turn 2 commander. Not quite as cheap but can help get you some +1/+1 counters from mentor as well as goblins to sac to Arms Dealer or Skirk Prospector is Legion Warboss . 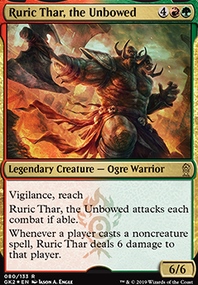 In addition to my standard recommendations of Skarrg, the Rage Pits and/or Kessig Wolf Run to give trample to the big beaters that don't have it, the first card I looked for on your list was Hardened Scales. 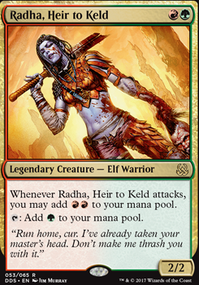 Its a cheap CMC way of getting more counters onto counters-matter creatures like hydras, especially for the early game when you don't have as much mana to pump into those X casting costs. Growing Rites of Itlimoc Flip will help you find creatures and then when you have enough in play, flip to help power up even bigger hydras mid to late game. Without guildgates to fetch, Circuitous Route should become Skyshroud Claim. The lands come into play untapped plus you can target your shocklands [you'll still have to pay the 2 life to bring them in untapped though]. Something I have found to work with my Dino’s is Farseek plus Canopy Vista and Cinder Glade. I put a fair number of Basic Forest in for them (I’m leaning mainly G/R+w). Also having more basics than maybe normal gives plenty for ranging Raptors to grab. I’ll often find if the game is going much past turn 6, I’ll have two basics out for sure and then those dual “battle” lands come in untapped. Another interesting land choice I am loving is Desert. Ping Ripjaw or Ranging, ping their creature each turn. Lots of versatility for that card in this specific deck. Creature wise I have many thoughts on that front. For now I would try 4 Thrashing Brontodon. It’s a great body being a 3/4 and with your heavy lean towards Dino cost reduction, will likely be just GG every game. Then in the pinch you have that convenience of sacking to get rid of a problem artifact or enchantment. My favourite ping spell right now is definitely Forked Bolt. The sheer versatility is amazing and feels especially good when draw a card and playing a land for only one R.
I’ve got many other thoughts on this deck type from my testing. Last but not least, one of my newer testing cards Skarrg, the Rage Pits. You could still use more card draw, Greater Good might work well here or maybe Life's Legacy. 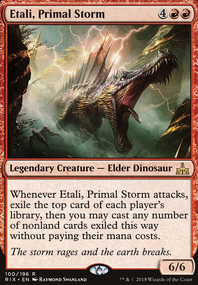 I'd cut Exoskeletal Armor for at least one piece of targeted removal, Beast Within [somewhat dino flavoured] or Chaos Warp, you want some interaction for the deck. 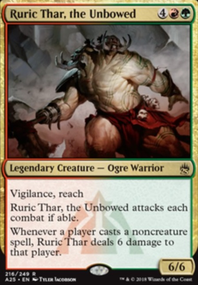 And any R/G big beastie deck can make use of Skarrg, the Rage Pits and/or Kessig Wolf Run to push some extra damage through.